The $5.8 million renovation consists of the tenant improvement of a 22,000 sq.ft. lab floor and infrastructure upgrade. 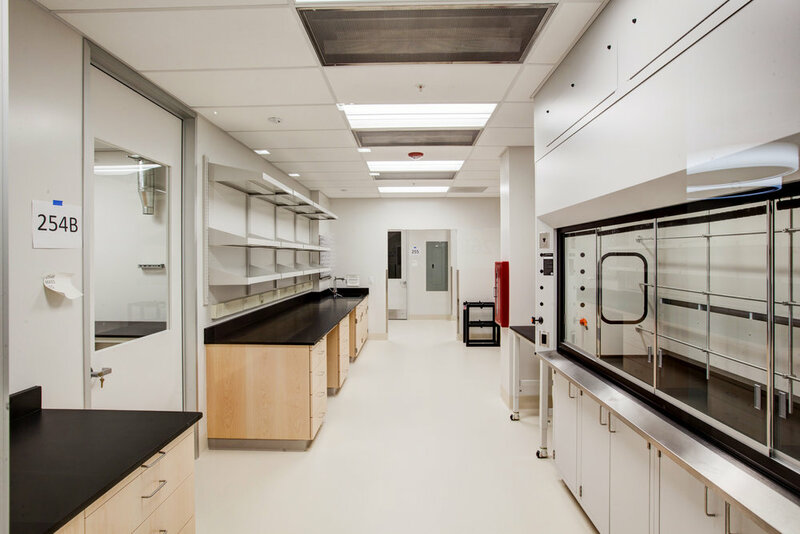 The program houses 26 VAV fume hoods, a mass spec lab, lab support rooms, and offices. A new centralized high plume exhaust fan was installed to manifold with the existing exhaust system to supplement the exhaust system capacity. Fast acting venturi air valves were specified for supply, lab exhaust, and fume hood exhaust for lab VAV exhaust operation. Fume hood face velocity setback controls, from 100 fpm to 60, is achieved by using proximity sensors and general lab air change setback controls is based on input of the room lighting occupancy sensors and scheduling from the BAS program. Extensive survey was conducted to verify existing conditions due to lack of as-builts. The Design Team specified the maximum dimensions of available access pathway for the air handling unit installation in a tight mechanical room. Gayner Engineers worked closely with Stanford’s Energy Management Controls Group in developing detailed sequences of operations for optimized controls and system integration. Other work items include a process cooling water storage and distribution system, a centralized nitrogen distribution system, a daylight harvesting system, full LED lighting fixtures with an automatic dimming lighting control system, lab vacuum, and lab compressed air.